NOTE: Greek readers may want to read the description that follows in their native language, by visiting the relative threads either at ubuntu-gr.org or at insomnia.gr (follow either of those links). I'm very sorry, but due to some nasty stuff happening in my life since the last few moths, I have no longer the time or the mood to finish the announced 1.0.3 release of the themes. I really hope things will go better soon. In that case I'll finish up the next release and publish it. When I tried the themes on Ubuntu 12.04LTS 32-bit, installed via wubi, both Gimp 2.8.2 (default on Ubuntu 12.04) and Gimp 2.8.14 (custom installation) were crashing before even showing the splash-screen (running them from a terminal, I saw that they were "core dumping"). This problem seems to occur only on my wubi installed Ubuntu, since other users have reported no problem with normal installations of Ubuntu 14.10, Debian and Arch Linux. The problem is the relative paths that I'm using for including the base-themes into the "gtkrc" file of each theme. So, I made a bash-script that changes the relative paths to absolute ones in all the "gtkrc" files, automatically: Fix for wubi installations of Ubuntu. 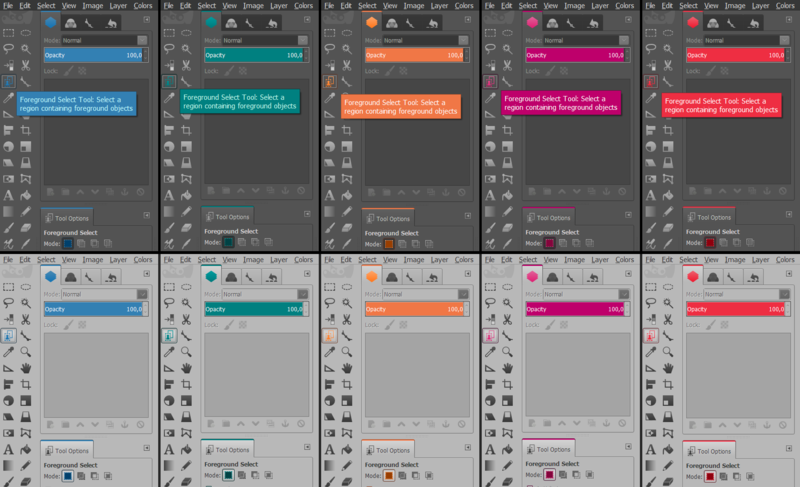 The original themes use orange as their main highlighting-color, including 8 variants, depending on the colorization of the remaining UI elements: Darker, Darker small, Dark, Dark small, Light, Light small, Lighter and Lighter small. The "small" variants use smaller icons and font. I have modified the 4 middle ones, namely: Dark, Dark small, Light and Light small. Moreover, each one of them comes in 5 highlighting-color versions: Blue, Orange, Pink, Red and Teal. This makes a total of 20 variations. Besides the additional highlighting-colors, other modifications include a bit wider scroll-bars & dragging-handles, along with slightly altered colorization of menus, tools, panels, tabs, radio buttons, checkboxes, tool-tips, etc. I have also changed the folder structure, so common resources are shared across similar themes (no more duplicated icons in each theme's folder). There is a separate "_further_modding.txt" file explaining it in more details, along with step by step instructions for adding new themes. I plan to modify the original "Lighter" themes too, but not the "Darker" ones. However, it may take a while. If you are using a different OS, you may need to do some googling. The folder: "_flat_gimp_icons/" MUST be extracted along with the other folders into Gimp's "themes/" directory, but it is NOT a theme. Rather, it contains all the data needed by all other themes in this collection. Put it otherwise, extract it but do NOT select it from within Gimp. 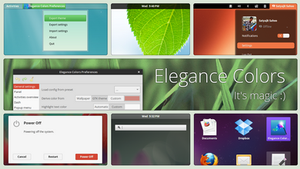 The themes use the GTK2 Cleralooks theming engine, which is NOT available by default on Windows installations of Gimp 2.8. I have bundled it from Partha's Gimp 2.8.14 builds ( www.partha.com ) in both 32-bit & 64-bit versions. It comes with its own "Readme.txt" file, with short instructions on how to install it in your current installation of Gimp 2.8 on Windows OSes. There's is also a small section inside the main "Readme.txt" file of the themes, dedicated to the Cleralooks engine. It contains hints for other OSes as well. For some reason, DA was not happy with the Clearlooks engine zipped inside the main zip-file of the themes. So, by following the above link you may download a .7z file that contains everything. PS. Many thanks to Andrew Pullins (aka android272) for the beautiful original themes. This is my very first submission to DA, I hope you find it useful. Basically, you need to download a .zip file (from the link provided above), extract the "clealooks.dll" file, and place it inside the "engines" folder of your GIMP installation. The only problem I've encountered so far is the colour of dialog buttons is a bit too light to read (But that should be easy an easy fix - I'll let you know what the solution is when I've solved it). 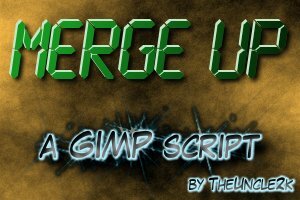 does it work on gimp 2.10? Is there a way to make gray (or black) go white? Or any other color I want? These are great! I just had to switch from Photoshop to Gimp, for cost reasons, and I was really hating the transition but your themes have made Gimp pretty equal with Photoshop for me. Cheers! Please make theme for libreoffice. It really need something beautiful like this. Fantastic! Now my gimp is like a professional software. Thank for your owrk. I copied all the folders inside the ZIP into C:\Program Files (x86)\GIMP 2\share\gimp\2.0\themes\ and went to my preferences, went to Themes and clicked the Dark Blue option. Reloaded GIMP but my theme just resets to default. Am I doing something wrong? EDIT: Okay it's working now, but I have a problem: I'm running this on windows 10 so some of the borders of the windows are automatically white, resulting in the light grey text being difficult to see. Can you please show a screen-shot of the problem? Also make sure you have also copied the clearlooks gtk engine to the proper folder. Yeap, you need to put the clearlooks-engine file into the proper Gimp folder. The link to download it is in the description above. Thanks! 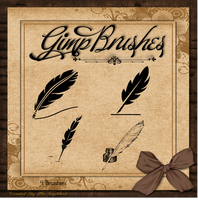 I know it's not reasonable, but Gimp's default look was a real problem for me - it didn't look like a "real" tool, and the bright backgrounds were distracting, especially when working at night. The developers should adopt a variant of these themes as defaults for future releases. 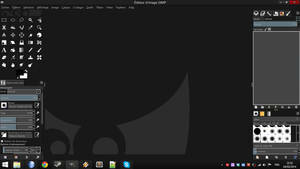 I'm using Ubuntu with Arc-darker theme. It seems your theme using the same background color as the system theme. How can i tweak it? Form the screen-shot, it seems like the gtk2 clearlooks engine is not installed on your system. The themes need it. Thanks for this! Hope things get better for you. Hope all things turn out well for you. Just wanna know how I can achieve those very nice looking tab. tab only available in ubuntu? Gtk2 which is responsible for the visuals is a cross-platform library. 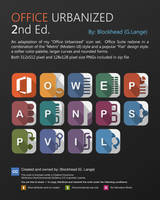 Perhaps you haven't copied the provided cleralooks engine files into the proper Gimp folder? I'm glad you like it, thank you for your comment! AWESOME work. Thank you very much. Sorry to hear you are going through bad times right now. I hope everything works out well for you. These are well made and look great. Thanks! I'm recently installed Gimp 2.9, theme works fine, but the icons are lost appearing the default Gimp icons. 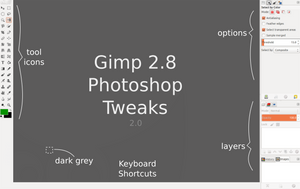 AFAIK, all gimp 2.9.x are marked as unstable versions, so this may have something to do with the problem you describe. Personally I only have tested the theme with the 2.8.x versions of Gimp, which are officially the stable versions. On a side note, I do know that the devs have announced that they will change completely the theming mechanism in Gimp 3, so perhaps the 2.9 versions are in a transitional state towards that direction. Most certainly, the theme will NOT work in Gimp 3 anyway. awesome and detailed work! great job man! simply awesome! 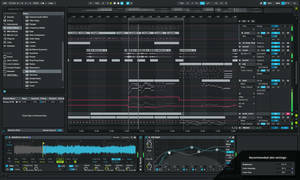 with this theme GIMP looks great and sophisticated. Thank you, I'm really glad you find them useful. These are phenomenal! Having all combinations of color, light, dark, regular and small themes, everyone should be able to find a theme that works for their needs. Also, the icon and tab changes further add to the beauty of these. Nice work! Thank you very much for your kind words! There are a few things that need to be sorted out (for example, the spacing of/in panels are too big on small monitors, even when "small themes" are selected). However, on big monitors (19" or larger) the current spacing is not a problem. Unfortunately, I don't know when I'll be able to finish the next release, due to some nasty turns in my life recently. You're welcome! Ah I see. Well, I hope things turn around for you. I'm working on version 1.0.3 of the themes. Hopefully I'll have them ready by the end of this week (or sometime during the next week). For the moment, I've added a screen-shot at the start of the description, showing samples of the improved "Dark" variants and the new "Darker" variants.